It’s hard to believe that it’s been over a month since our summer kick-off concert, Summer Songs at the Presentation House Theatre in North Vancouver. It’s even harder to believe that we’re over halfway through July – the summer is flying by! We had a magical time performing for a crowd of about a hundred guests at Presentation House on June 15th. We loved seeing new faces in the audience, and of course, were honoured to perform for dozens of returning fans too! Our first full-length spring show featured many favourites from our regular repertoire, but we also debuted a handful of new songs too. These included Fever (arranged by local composer, Sarah Jaysmith), Sound of Silence (arr. Deke Sharon), Sililiza (by Jim Papoulis and featuring Zoltan Virag on djembe), Songbird (arr. Deke Sharon) and The Way You Make Me Feel (arranged by our own Eran Sudds). But our favourite song of the night would probably have to be That Man, which is truly one of the most enjoyable songs to sing. Make sure you watch until the end for Laura’s incredible cat impression! We want to thank all the amazing fans that came out to support us – it was such a fun night! But after an intense spring of preparing for Summer Songs, Sweet Scarlet has taken a little bit of a breather for a few weeks. 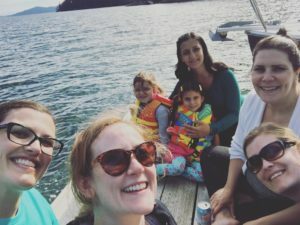 While most of us did meet up for an epic family weekend at Heather’s cabin on Gambier Island, we’ve mostly laid low, enjoyed time with our families, and rested our vocal chords. Two of our members are expecting babies later this summer, so we’re excited to increase our brood of children from 11 to 13, but for now, we’re enjoying the time off and looking forward to our annual holiday music listening party in a few weeks! We hope you are enjoying your summer as well, as we look forward to seeing more of your lovely faces this fall and winter, as we head out for some tour dates!